The Magic Extractor command in Photoshop Elements enables you to make selections based on your identification of the foreground and background portions of your image. The way this tool works is you specify your foreground and background by clicking these areas with the brush tool and “marking” them. Click the magic OK button, and your object or objects are extracted. Although it isn’t mandatory, you can make a rough selection first before selecting the Magic Extractor command. This technique obviously restricts what’s extracted and can result in a more accurate selection. The huge Magic Extractor dialog box appears. Grab the Foreground Brush tool and click or drag to mark the foreground areas — or the areas you want to select. Like with the Selection Brush, the more accurate the data you provide to the command’s algorithm, the more accurate your extraction. Be sure to use the Zoom and Hand tools to help magnify and move around your image, as needed. You can also change the size of your brush tip (from 1 to 100 pixels) in the Tool Options area on the right side of the dialog box. If necessary, change the color of your foreground and background colors by clicking the swatch and choosing a new color from the Color Picker. Select the Background Brush tool and then click or drag to mark the background area or the portions you don’t want to select. 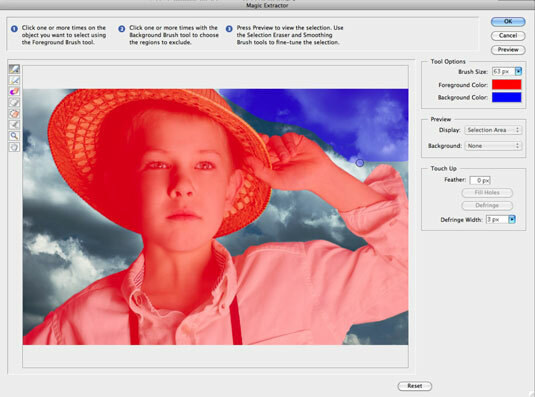 The Magic Extractor allows you to identify foreground and background areas. Click Preview to view your extraction. Elements churns for a few seconds before presenting the extraction. You can change the preview by choosing either Selection Area or Original Photo from the Display pop-up list. If you want to see your selection against a different background, choose one, such as black matte for a black background, from the Background pop-up list. To erase any markings: Select the Point Eraser tool and click or drag over the offending areas. To add areas to the selection: Click or drag over your desired areas with the Add to Selection tool. To delete areas from the selection: Drag with the Remove from Selection tool. To smooth the edges of your foreground selection: Drag over the edges with the Smoothing Brush tool. To soften the edges of your selection: Enter a value in the Feather box. Remember: The higher the value, the softer the edge. To fill a hole: Click the aptly named Fill Holes button. 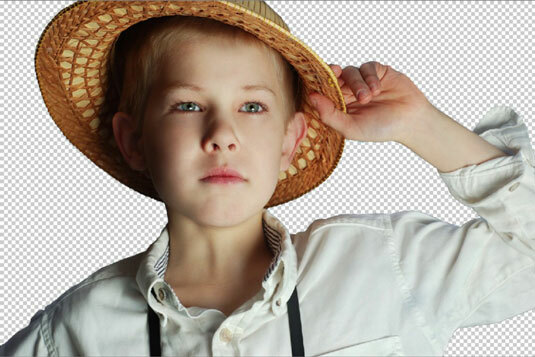 To remove the halo of pixels between the foreground and background areas: Click Defringe. Enter a value in the Defringe Width box. If things start to get messy, you can always start over by clicking Reset at the bottom of the dialog box. When you’re pleased with the results, click OK to finish the selection process and close the Magic Extractor dialog box. The newly extracted image appears. A boy selected with the Magic Extractor.